This is the lass which drives all output of COPASI. Definition at line 112 of file COutputHandler.h. Definition at line 26 of file COutputHandler.cpp. Definition at line 33 of file COutputHandler.cpp. Definition at line 40 of file COutputHandler.cpp. Definition at line 140 of file COutputHandler.cpp. Referenced by CScanTask::initialize(), CTSSATask::initialize(), CTrajectoryTask::initialize(), CCrossSectionTask::initialize(), and CCopasiTask::initialize(). Definition at line 47 of file COutputHandler.cpp. References compileRefresh(), mInterfaces, COutputInterface::mObjects, mpMaster, and setMaster(). Referenced by COutputHandlerPlot::compile(), CCopasiTask::initialize(), and CMoietiesTask::process(). Definition at line 174 of file COutputHandler.cpp. 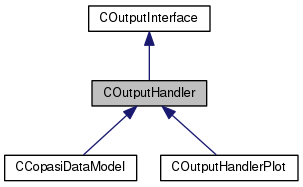 References CCopasiObject::buildUpdateSequence(), CCopasiObject::getCN(), CCopasiDataModel::getModel(), CModel::getUptoDateObjects(), mObjectRefreshes, COutputInterface::mObjects, and CCopasiDataModel::ObjectFromName(). Definition at line 105 of file COutputHandler.cpp. Referenced by main(), and validate(). Definition at line 42 of file COutputHandler.cpp. Definition at line 163 of file COutputHandler.cpp. Definition at line 80 of file COutputHandler.cpp. References mInterfaces, mpMaster, and refresh(). Definition at line 166 of file COutputHandler.cpp. Definition at line 150 of file COutputHandler.cpp. Referenced by finish(), and COutputHandlerPlot::removeInterface(). Definition at line 94 of file COutputHandler.cpp. Definition at line 160 of file COutputHandler.cpp. Referenced by addInterface(), compile(), and removeInterface(). A list of all active output interfaces. Definition at line 202 of file COutputHandler.h. Referenced by addInterface(), COutputHandlerPlot::compile(), compile(), finish(), getInterfaces(), output(), removeInterface(), and separate(). Definition at line 213 of file COutputHandler.h. Referenced by compileRefresh(), and refresh(). Points to the master handler. The master handler is responsible for the and object updates and all the output. Definition at line 208 of file COutputHandler.h. Referenced by compile(), isMaster(), output(), and setMaster().